It seems Nigerian music star, Davido, didn't help David Adeleke, who shares same name and surname with him, after he offered to in a Tweet that went viral. 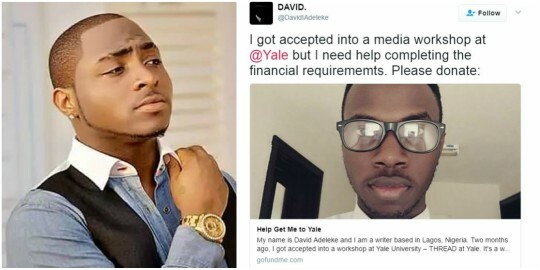 David Adeleke reached out to his followers, to assist him with the financial requirements for a media workshop at Yale.However, David Adeleke who did setup a GoFundMe page to try to reach his goal of $3,500, was asked by Davido to send a DM so he can help since they share same name and surname. slam Davido for not helping, after he promised to.